The X1800 Prime is a return to form for Denon DJ in the mixer market. 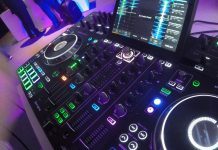 It’s designed to be the perfect partner in a Prime setup alongside the SC5000, but it will stand its ground in any setup, and is equipped to satisfy the needs of even the most demanding DJ. The Denon DJ X1800 Prime was designed from the ground up to be the beating heart of the Prime system, and while the SC5000 media player gets most of the attention, the whole system wouldn’t work without a mixer that it’s up to the task. And the X1800 definitely is up to it. With an all-metal construction and large form factor, the X1800 will certainly take some space in the DJ booth, but rest assured, that extra space is used up very well. The X1800 has some innovative features, and to me, the most notable being the double row of filter and effects knobs for each channel. 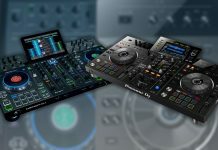 For the first time, you don’t need to choose between effects (Denon DJ calls them sweep effects, while Pioneer DJ has sound color effects) and the filter, since the X1800 has a dedicated knob for each. This means more creative possibilities, as you can easily combine the filter with any other available effect at will. 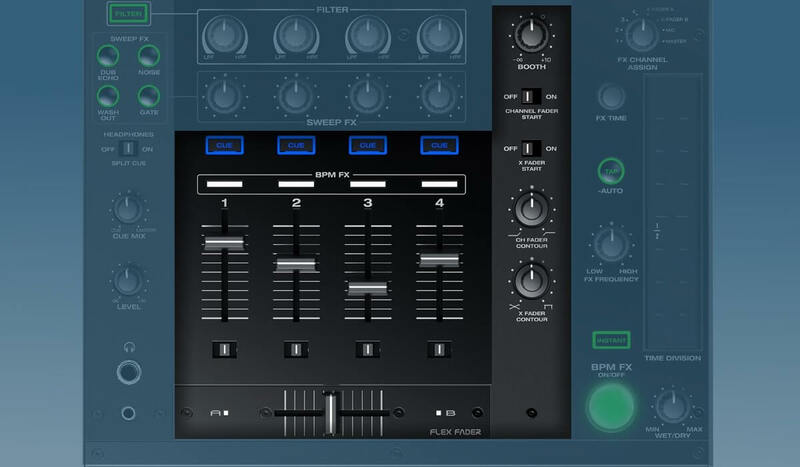 The FX module also has some innovative features, the most important one being the touch strip to manipulate the effects. 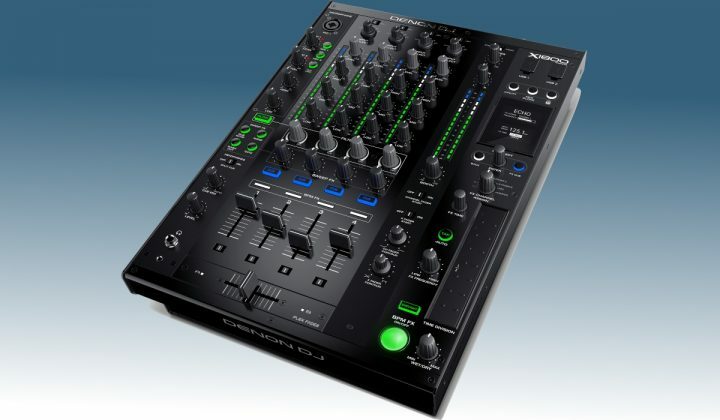 The X1800 has furthermore double USB inputs to connect two laptops at the same time making DJ changeovers easier. The X1800 is Serato DJ Pro certified and as such will work with your Serato DVS setup. The microphone section on the left top corner of the mixer is very clearly designed and easy to use. Having the MIC 1 input right there is handy, as it’s easily accessible. Not however that there is no extra AUX input here, this is a mic channel only, so you cannot connect an extra audio source, in case your four main channels are all used up and you still need to add something else. There are knobs for the volume levels of both mics, and clearly backlit buttons to switch each mic on and off. And below that, there is a dedicated high/low EQ section. It’s also possible to assign the FX channel to the mic and add any effect you wish to the mic’s output. Again, the headphones section is kept clean and simple: a split cue on/off switch, a cue mix knob, a level knob, a 1/4” (6.35 mm) headphone jack and a 1/8” (3.5 mm) headphone mini-jack. Not much to say except that everything you need is right there. The VU meters replicate the green/white/blue color scheme of the X1800, and that is quite different from the usual green/orange/red. I definitely prefer the later for the VU meters as blue doesn’t scream “you are going in the red idiot!” as blue does, but you get used to it pretty quickly. The input selection is very well laid out in my opinion. First of all, each channel can be set to one of the two USB inputs. Next, you can toggle between the digital, the line, the phono, the USB and the DVS inputs. One small point of critique might that it’s quite hard to see which USB port is assigned to each channel, so a small led next to USB 1 and USB 2 would make things a bit clearer here. The X1800 Prime has a 3 band EQ section that can be switched between classic and isolation mode, and more settings, such as the crossover frequencies for the high/low EQ ranges, can be changed from the utility menu. The master channel controls are located to the right. There is a handy mono/stereo switch, as in most situations you would want to output in mono rather than in stereo. Here the X1800 Prime sets itself apart from the rest of the competition. 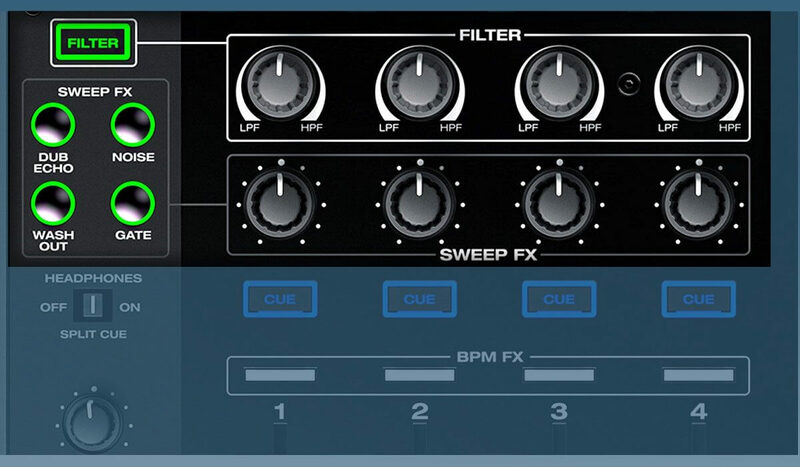 First of all, there are the sweep FX: dub echo, noise, wash out and gate. 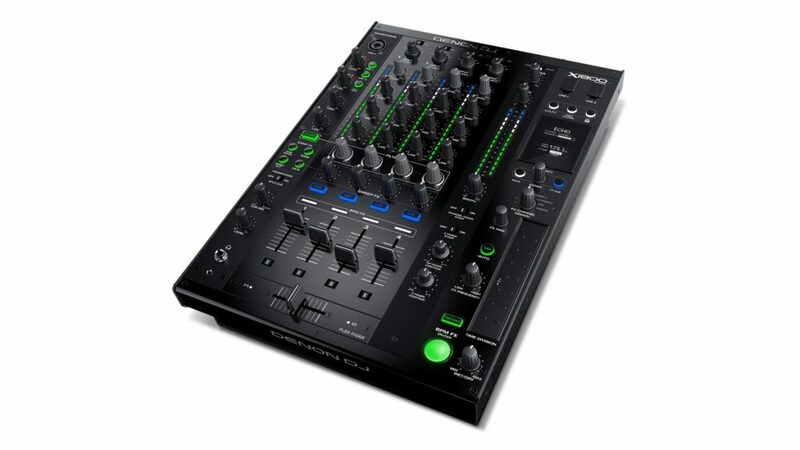 These are very similar to the sound color FX from Pioneer DJ. These are great sounding effects, and I especially liked the dub echo. Note that there is no “filter” sweep effect, as the filter as dedicated knob per channel. As a result, you don’t need to “think” about selecting the filter before using it: it’s always on, and because of the filter on/off button above the sweep fx buttons, you can stop the filter effect at any time with the click of a button. I really like this approach, as it not only makes the filter more easily accessible, but it opens up new creative possibilities: you can combine any sweep effect with the filter, and even if that sounds like overkill, it can really spice up your build-ups when used correctly. The faders are, as expected, top notch on the X1800 Prime. 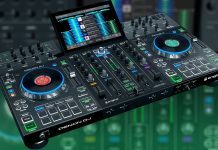 If you use Engine Connect (ethernet) to hook up SC5000 Prime players the CUE buttons can match the color of the selected layer on the player, thus making it easy to follow which deck layer is connected to which mixer channel. Check out my review of the SC5000 if you want to learn more about this feature. Also, there are LED strips that indicate for each channel if the BPM effects are activated, which is also a great visual help when mixing. To the side, you can set the faders to fader start or the crossfader to crossfader start, and there are two “contour” knobs, one for the line faders and one for the crossfader, to alter both curves. The effects module on the X1800 Prime is truly full of interesting, and innovative features. The LCD screens are monochrome but very clear and easy to read. The selection of effects is done with a rotary knob with the selected effect’s name displayed on the screen. The effects are of very high-quality, as expected. Using them with the touch strip is a cool experience. 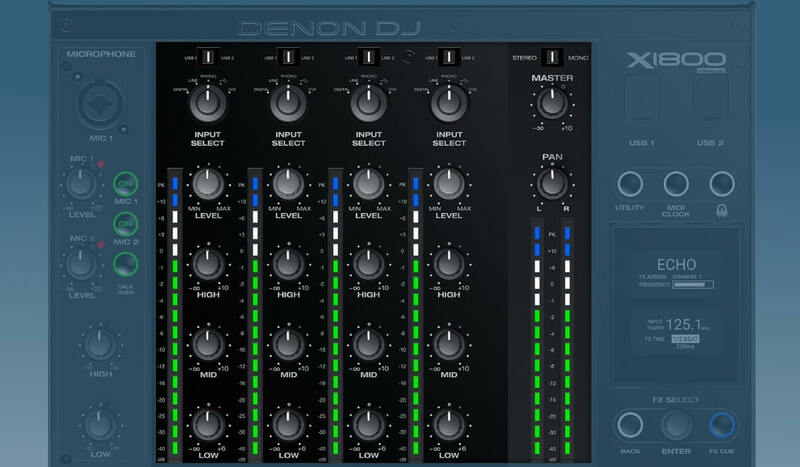 There are in total 10 effects out of the box, but since the effects aren’t mentioned on the mixer’s faceplate and only in the software, it’s possible that Denon DJ could add more effects in the future through firmware updates. • Echo: This effect adds echoes of the original signal. • Delay: This effect adds repeated instances of the original signal that decay over time. • Trans (transition): This effect cuts off the original signal at a regular rate. effect (often referred to as resembling a jet plane engine). • Filter: This effect varies the filter cutoff frequency at a regular rate. create a subtle, modulatory effect. backward at a regular rate based on the current time division. There are several ways to customize the effect parameters. First of all, the X1800 has a touch strip to manipulate the effect’s beats. It’s a different approach and quite intuitive since you can slide your finger across the beat spectrum and change the beats on the fly. There is also an instant button to make the effects go on when you touch the touch strip and off when you lift your finger, which is really cool to play around with. An effect “wet/dry” is also there, as well as a big effect on/off button. 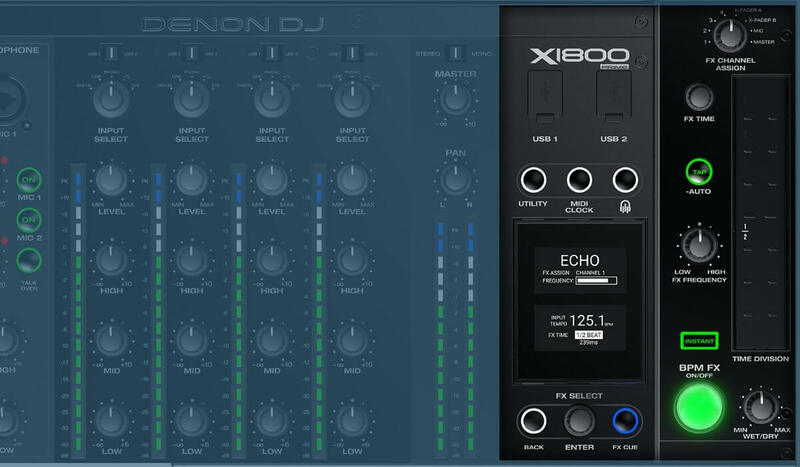 The utility section is quite extensive on the X1800 and allows to lock certain settings, further tweak the EQ curve, change mic settings, and more. 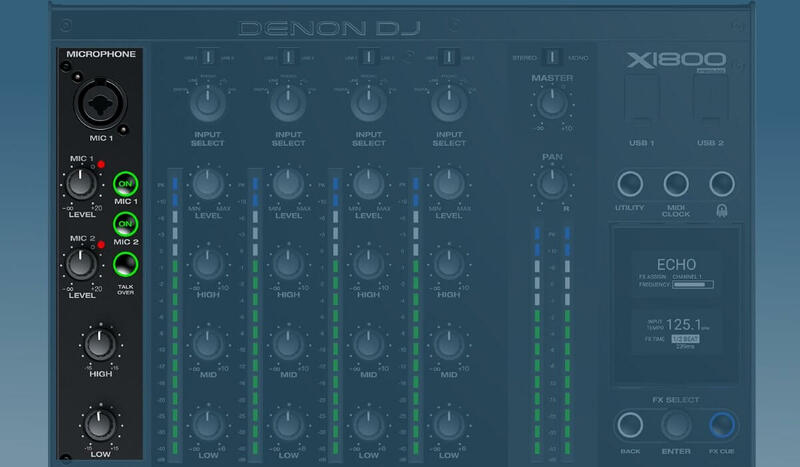 it’s a good move by Denon Dj to move certain settings to the utility menu and not to assign to a physical control on the mixer itself, as it ensures a cleaner mixer layout. Most advanced features are rarely used anyway, so having them sorted in a utility menu is by far the best solution. 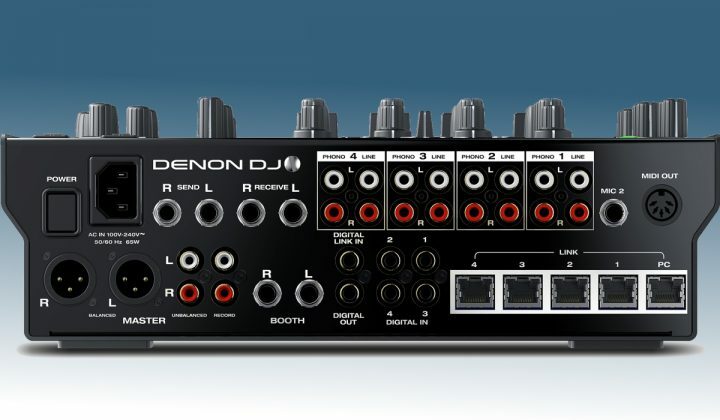 On the back, the Denon DJ X1800 has absolutely everything you would ever need as a DJ. Let’s start with the outputs. There are balanced XLR, unbalanced RCA master and an RCA master output. There is also an RCA record output. If you prefer to go digital, there are also digital inputs & outputs available. Each channel has their dedicated RCA output for line and phono. This mixer can send out midi clock and there is dedicated midi out port. Note that in the settings you can set the USB ports to send out midi clock as well. Also, if you want to use external effects, there are dedicated send & return connections available. Lastly, there are 4 ethernet ports to hook up the SC5000 players using the Engine Connect protocol to send player data back and forth between the players and the mixer. 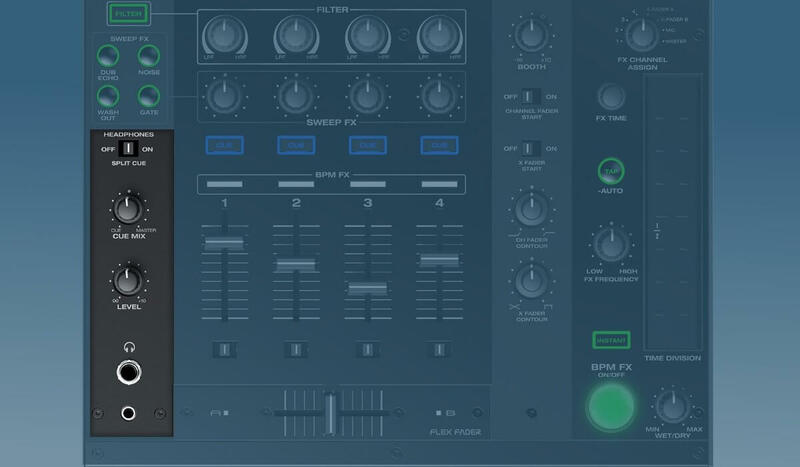 Using this has many advantages, from precise BPM sharing for your effects to sharing data between the players and the mixer. For example, if you use the layers feature on the SC5000, the cue buttons on the channels of the X1800 will have the same color as the selected layer on the SC5000. 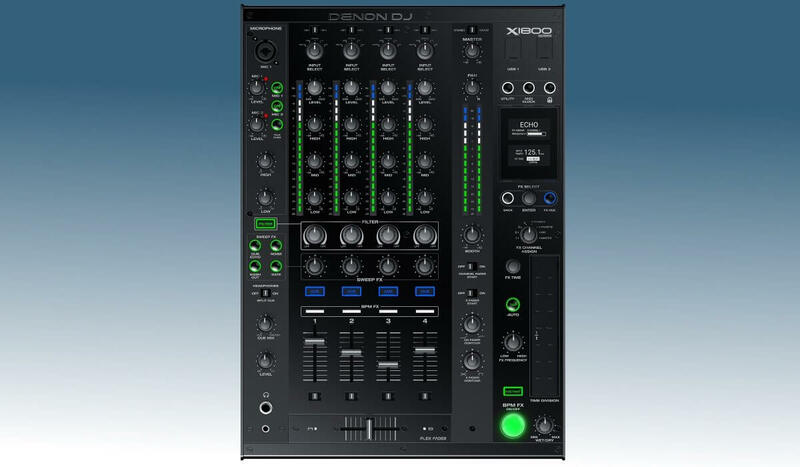 The X1800 Prime is a return to form for Denon DJ in the mixer market. It’s designed to be the perfect partner in a Prime setup alongside the SC5000, but it will stand its ground in any setup and is equipped to satisfy the needs of even the most demanding DJ.